Don Spence and Randy Cino founded Condenser & Chiller Services, in October 1985, after having both worked for an A/C distributor and condenser tube manufacturer. Both of them performed non-destructive eddy current inspections on new tubes being manufactured in the late 1970’s and early 1980’s, for both quality assurance as well as field inspections for Hartford Steam Boiler and other large insurers. At this time, Eddy Current testing was still very new to the commercial/industrial heat exchanger industry. When they first opened their business, the two of them rented a 1500 square foot building. Now, the business has grown to operate in a 40,000 square foot facility on 4 acres of land. The business provides total heat exchanger shell and tube inspections, manufacturing, tube bending, Belzona epoxy coating, and ASME retubing repairs. The owners purchased a tube mill from their previous employer in early 2000, and opened California-Fin-Tube as their ASME/ASTM /Mil-T tube manufacturer for replacement condenser, evaporator, and heat exchanger tubes. Cal-Fin produces heat exchanger tubes, condenser tubes, evaporator tubes, lube oil cooler tubes, ammonia condenser and evaporator tubes, and U-bend tubes for all major brands of units, and in many different alloys. The owners are also Navy and Nuclear qualified for integral fin tube testing and manufacturing of replacement tubes. We employ 27 full time technicians and staff for all types of heat exchanger services. We inspect over 1.2 million heat exchanger tubes per year using state of the art Eddy Current, Remote Video and Ultrasonic Inspection equipment. 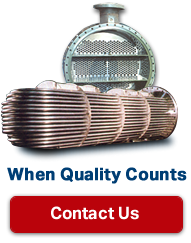 We are an authorized factory warranty heat exchanger service provider for many of the OEM manufacturers. Our testing group utilizes Hocking Electronics, and Olympus-Nortec equipment for both our eddy current tube inspection and ultrasonic shell thickness inspections. We use the state of the art GE Acu-View remote video inspection camera for our internal tube and component photography. These new cameras have a 20 foot long cable with the ability to measure defects, and thumb drive storage for video or still pictures. Our technicians have been in the industry for over 30 years and have a sterling reputation that is nationally recognized. Our coatings division uses portable vacublasters to remove rust buildup and debris from condensers, evaporators, heads, etc. We then apply several coats of 100% solid epoxy resin. We are a specialized Belzona coating products applicator. We warranty all of our services for up to five years. We dismantle and rig old chiller units for removal and provide scrap salvage value, while clearing the space for your new chiller arrival or building renovation. Our capabilities enable us to perform these services throughout the world, or you can ship the unit to our fully equipped machine shop.